As one who writes majorly about pressing life issues and self-improvement, I have had the privilege of people confiding in me for advice on many things. In the cause of talking to them, one thing I find very common with most of these people is that they have a way of believing that a certain evil force or spiritual being is responsible for their predicament even when it is glaring that what they are going through is as a result of their own mistakes and negligence. If you have followed me closely on this platform, then you would have observed that one of the things I have always advised people to do is to quit blaming witches, people or circumstances for the outcome of their lives and begin to take responsibility for themselves. And even now, if there is anything that I Ugoma Johnson could do for you reading this post right now, it would be to open your eyes to the power that resides in you to make the most of your life leveraging on who God has made you through the finished work of Christ at Calvary. Am I saying there are no witches? No! All I’m saying is focus on who Christ has made you through His death. The work of a witch is to stay woke at night or whatever time he chooses to carry out his evil work, but your job is to REST IN CHRIST! REST ABEG. Remember the scripture that says…. Can anyone hold or harm a shadow, talk more of harming that which is under the shadow. You see, God has given you all that you need and will ever need to live a meaningful life on earth. But I’m afraid you may never get to live life to the fullest if all you do is sit around and play the blame game. As a believer, you have no business with a spiritual husband, so stop blaming your singlehood on spiritual husband and start working on improving your attitude people. The challenges you are currently experiencing in business may not be demons coming to attack you, it could just be a result of some wrong business decisions you have made in the past. That woman your husband is cheating on you with may not have put any love portion in his food, it could be that you have ignorantly nagged your husband into the arm of another woman. That illness may not be a result of the evil attack, it could just be your body reminding you to pay attention to your diet and hygiene. Please get that into your head ok. This post is already getting longer than I thought, but before I finally drop my pen, let me leave you with these words. No witch is powerful enough to stop you from becoming whom God has made you to be. You can either be your number one with or your number one prophet. 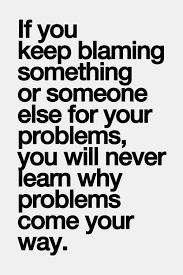 Quit blaming and start being responsible for yourself.